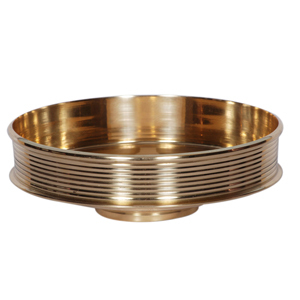 Brass Bowl(Urli).This beautiful brass vessel is an ?Uruli?. Today, Urulis are very much in demand to lend living rooms or hotel foyers an ethnic feel with flowers or candles floating in them. Urulis are also great for everyday cooking, except they?re heavy and difficult to cook with on the modern gas stove. A lot of the cooking for traditional wedding feasts is still done in Urulis. Uruli is a traditional cookware used in Kerala. It is circular in shape and is made of bell metal (a variety of bronze). Urulis are used in temples and restaurants, and special occasions to cook large amounts of food in houses.